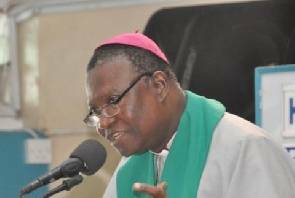 Presiding Bishop of the Methodist Church of Ghana, Most Reverend Emmanuel Asante, has stated that about 70% of Ghanaian politicians who claim to be Christians easily forget their doctrines when voted into office and rather choose to engage in corruption to the detriment of all Ghanaians. He made the statement at Wenchi in the Brong Ahafo Region on Saturday to mark the yearly celebration of the Methodist Mens Fellowship of the Methodist Church on the theme: ‘Holistic Spirituality’. According to him, being holistic in spirituality involves being discipline, diligent at work and being punctual at the work places, among others. Most Reverend Asante added that Christians must contribute their quota to nation building because at the end of the day, all and sundry stand to benefit when the economy of the country improves. The Queenmother of Wenchi Traditional Area, Nana Atoa Sramangyeduam, who also spoke at the function recollected how the Wenchi Senior High School came into being through the hard work of the Methodist Church and praised the church for establishing a university college at Wenchi.